I am currently on maternity leave until September. It will have been a year since I was fully employable and four months since I left work completely. I may or may not have much of a job when I return. Such is the working life of the self-employed. My income never has any guaranteed minimum, and after taking all this time off to be large and pregnant and then care for two newborns, it’s bound to take a hit. Being self-employed, I am both the employer and the employee and am taxed accordingly—nifty, no? I am the dancer, dance instructor, promoter, and financial organizer. I am lucky to have a live-in, free web designer—thanks, Hubby. I’m hoping that with a couple of emails here and a few there, I may resume my teaching once a week without much change in my enrollment numbers. Classes are typically slow in the summer, so coming back to teaching in September shouldn’t impact that income. Since leaving the restaurant back in November, due to wracking morning sickness and my rapidly swelling mid-section, the owners have since decided not to have dancers. I’m hoping that through a few connections, I may be able to do restaurant gigs once a month—or at the very least make a regular sub list. But then again, my more-than-full-time gig as the mother of three children may make that difficult. We’ll see. The problem is, my mommy gig doesn’t help pay the bills or pad the savings account. 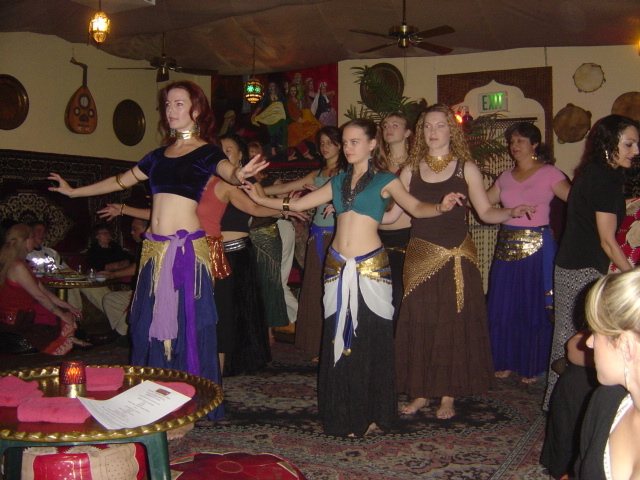 I hope to keep accepting private party opportunities (bellydancers make birthday and anniversary parties fantastic, by the way; people will talk about your event for years to come, I swear…yes, hire me) the way I did last summer and fall. Once my abdomen began to swell, I had to stop with that, though. The twins did make an appearance at a birthday party, albeit cleverly disguised in an alternative costume that covered my stomach. And then there’s writing. Which I can do while sitting on my living room floor, or propped up in bed with a babe at the breast—though I have yet to really master one-handed typing. It’s my hope that my writing will provide more and more over the years, as it fits into the schedule of carpooling, dinner-making and bedtime story- reading much better than having to pile on the mascara and sequins and going out to perform. Though I would miss the dancing if I didn’t do it. Another dilemma of self-employment—when to retire. Whether dancing or writing, the Destitute and Obscure keep creative and persevere, cobbling together a living and a lifestyle that keeps food on the table and our souls well nourished.